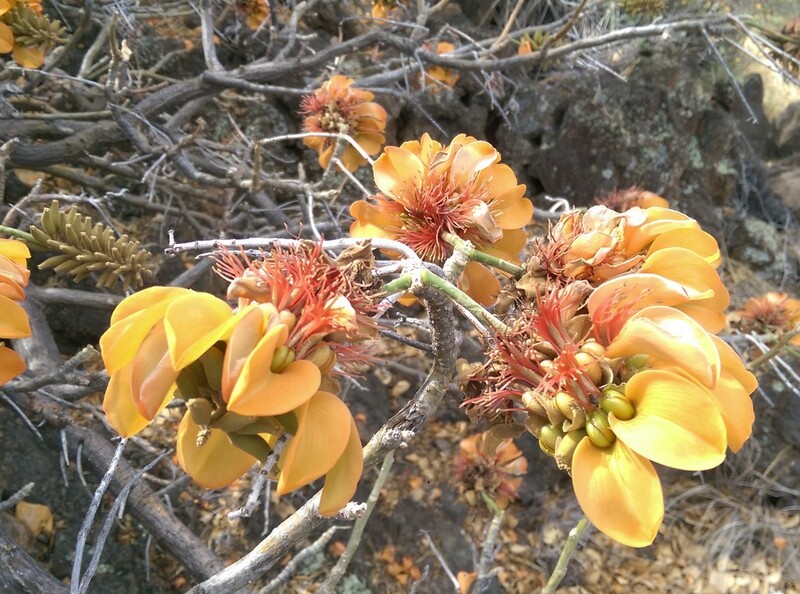 This week the Waikoloa Dry Forest Initiative is hosting two guided walking tours of the Waikoloa Dry Forest Preserve to showcase the incredible flowers of the wiliwili. The ongoing, strong el niño has brought severe drought to our islands and the effects are apparent in the dry, dusty conditions in the lowlands of Waikoloa. In the Waikoloa Dry Forest Preserve however, our drought-adapted wiliwili trees are putting on an early display of beautiful orange blossoms. Our native wiliwili (Erythrina sandwicensis) is one of few drought-deciduous trees in Hawaiʻi and typically drops its leaves in the dry summer months before flowering. This year’s extended drought has prompted an early flowering season and brought some color to our dry landscape. The wiliwili trees among the most iconic of our dryland forests in Hawaiʻi and their flowering season has been a notable occurrence throughout history. Hawaiian people observed that during the flowering season of the wiliwili there was an increase in tiger shark activity near shore as told in the Hawaiian proverb, “Pua ka wiliwili nanahu ka manō”, which can be translated “when the wiliwili bloom, the sharks will bite”. This ancient saying draws a correlation between the typical autumn flowering of the wiliwili and the pupping season of tiger sharks which many believe causes them to behave more aggressively. Although the flowers are early this year, it may still be a good idea to be extra cautious in the water. Visit the Waikoloa Dry Forest Preserve and see the spectacular flowers and learn more about the forest restoration work happening in Waikoloa. Forest preserve tours will be held from 9am-11am on Wednesday April 20th and Saturday April 23rd. Participants will meet at the junction of Waikoloa Road and Quarry Road in Waikoloa Village. Transportation into the preserve will be provided by WDFI. Please reserve a spot by calling (808) 494-2208 or emailing wdfi@waikoloadryforest.org. Waikoloa Dry Forest Initiative is a 501(c)(3) nonprofit supported by our community; a $20 donation is suggested for the tour.